After a few months, Leizhan’s order for Egypt paper mill is almost finished, the project they have this time is 150T/D Corrugated/Kraft/White Carton Paper Making. The picture above is the delivery site. Mid Pressure Screen: This screening machine divided into coarse screening, fine screening and fractionating screening, Egypt customer purchased coarse screening machine use in coarse screening part. High Speed Stock Washer:Mainly used for washing and concentrating waste recycled pulp, chemical pulp before or after bleaching, can effective remove ink particles, fillers, and other small impurities from slurry. Inflow Pressure Screen: Used in pulp flow system, the special design can get more homogenate pulp, get higher quality paper. 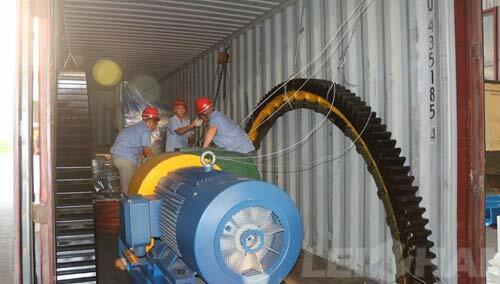 Fan Pumps: It is an indispensable equipment in paper mill, used to flow pulp in every stage. Drum Pulper: Continuous and gentle pulping, automatic discharge impurities, don’t need other equipment like Grapple, Raggle, Sediment Well, etc, which is convenient and fast. If you want to know more details? Feel free to consult us: leizhanchina@gmail.com.